You know those days when you have so many things you want to do, but can't seem to get out of your own way? That happens to me occasionally, and at the end of the day, I am frustrated that I didn't accomplish what I had intended when I woke up that morning. This past month has been so rainy, that getting motivated can be a little bit of a problem. But... since it has been so wet and cold this spring, I have been doing more baking than usual. Therefore, I have so so many blog posts to write. I am falling behind and my folder of photos is growing faster than I can blog. I hope you are willing to wait because there is a lot of good food coming your way. And speaking of food and getting in your own way, these volcanoes are something I had the ingredients in the fridge for at least a week before having enough time to bake. The wait was so worth it though. Who would have thought that a few random recipes in the back of an epic cake cookbook would be so amazing. Let me break these bad boys down for you. First, you have a very simple homemade dough, then you stuff it with caramelized onions, baked scalloped potatoes, browned pancetta, and shredded cheddar cheese. I mean seriously, doesn't that sound amazing!? There are a lot of moving parts in this dish, but the time is worth it. I ended up doubling the recipe and freezing whatever we didn't eat. These make a killer breakfast, lunch, dinner or snack! Make it, eat it, be happy. To make the scalloped potatoes, smash the garlic clove with the flat side of a knife to release the juices, and remove the peel. Place in a small saucepan with the cream, milk, bay leaf, rosemary, salt and pepper. Bring to a simmer over low heat. Once simmering, remove from the heat, cover, and let steep for 30 minutes. Meanwhile, chop the pancetta into small pieces and brown in a small saucepan over medium heat. Once browned, set aside. Peel the potatoes and slice about 1/8-inch thick (a mandolin is very handy here). Submerge the sliced potatoes in cold water in a large bowl to prevent browning. Heat the oven to 350ºF. Have ready a 6-inch square pan. Layer the potatoes like shingles in the pan, sprinkling pancetta between the layers. Remove the herbs and garlic from the cream. Once all the potatoes are gone, pour the cream over the layered potatoes. Place in the preheated oven and bake for 45 minutes, or until the top of the potatoes are slightly golden brown. Place a large piece of parchment or wax paper over the top of the potatoes, then cover with plastic wrap. Place bowls of leftovers or a heavy book over the top of the potatoes to keep them condensed and refrigerate for 2-3 hours. To make the caramelized onions, heat the 2 tablespoons oil in a heavy bottomed pot over medium-high heat until shimmering. Stir in the onions and salt. Cook, stirring often, until golden brown and caramelized, about 20 minutes, adjusting heat as needed so they don't burn. Cool completely before using. To assemble the volcanoes, preheat the oven to 375ºF. Have ready two baking sheets lined with parchment paper or a rubber baking mat. Divide the dough in half. Refrigerate or freeze one half for future use. Divide the remaining half of dough into 4 equal pieces. Using your fingers, gently stretch the dough into a 6-inch circle. Divide the caramelized onions equally between the 4 rounds, and spread over the dough. Cut the chilled potatoes into 4 3-inch squares. 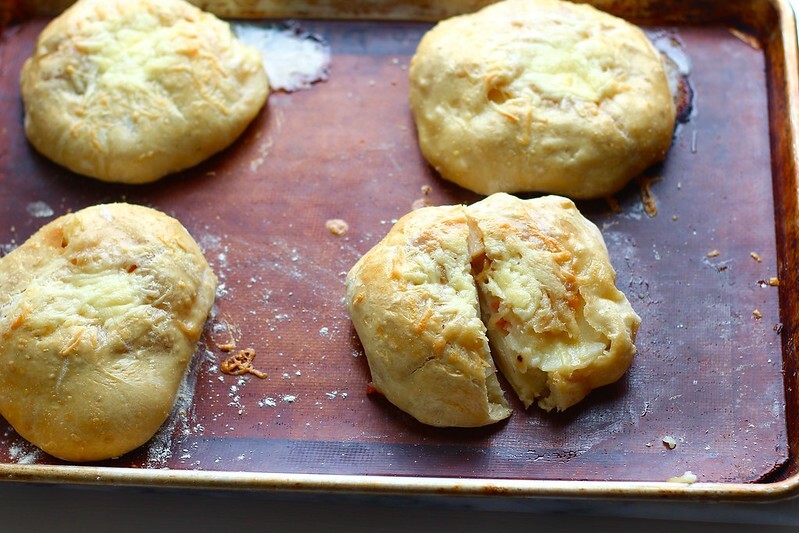 Place the potato squares in the center of each dough circle, on top of the onions. Pull the edges of the dough over the top and pinch the seam together. Roll the dough over and gently rock back and forth to seal the seam. Place on the prepared baking sheet, seam side down, and repeat process with remaining dough, onions and potatoes. Brush the rolls with the egg wash. Then, slice a small "x" in the top of each roll. 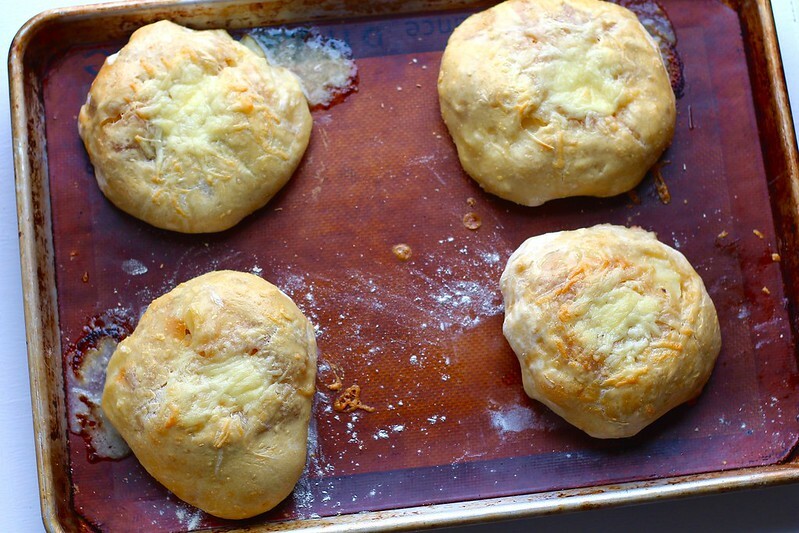 Divide the shredded cheese into 4 equal mounds, then stuff into the cut x.
Bake the volcanoes for 25-30 minutes, or until the dough is golden brown and the cheese is bubbling. Let cool slightly before serving. Refrigerate or freeze any leftovers, warming in the oven before serving again. *The dough makes double what you will need for the volcanoes. You can freeze the remaining half for future use.